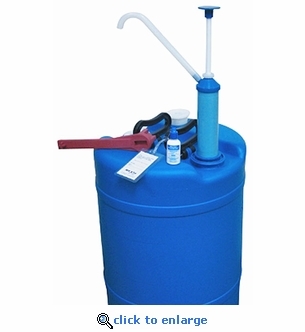 This 15 gallon emergency water storage kit comes complete with an FDA approved plastic container, siphon pump, bung wrench and a bottle of water preserver concentrate. The 15 gallon kit is perfect for emergency water storage when limited space is available, such as an apartment, condo or mobile home. 15 gallons of emergency water can provide one month of drinking water for one person (1/2 gallon of water per day). Natural disasters can contaminate a municipal water supply for weeks. Be prepared. Don't be caught by surprise. Heavy duty plastic bung wrench. Weight when full: 129 lbs.